The Ancient Astronaut Hypothesis, also sometimes called the Ancient Aliens Hypothesis ( AAH ) proposes that Earth was visited in ancient times by extraterrestrials ( ETs ). 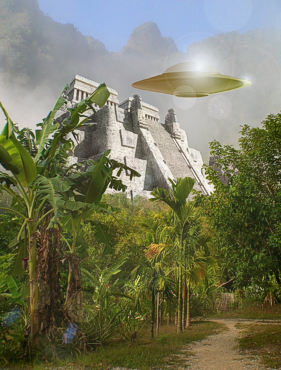 The typical form of the hypothesis is that these aliens advanced human evolution and participated in the construction of ancient cities and pyramids around the world. For reasons unknown they then left. Some versions propose that the extraterrestrials did not leave and that humans are their descendants. Other versions suggest that the ETs are still here, living clandestinely among us and are responsible for both ancient and modern-era UFO sightings. Other versions propose that the aliens may not have been ETs at all but visitors from another time or perhaps an undiscovered terrestrial civilization such as Atlantis. There is very little evidence to support any hypothesis, and what does exist is difficult to verify. What can be verified is that although curious archaeological artifacts exist, proponents of the AAH tend to exclude more terrestrial explanations, favoring instead, alternative interpretations based on mythology and religion. For this reason most skeptics tend to dismiss the AAH. Among the residual number of genuine mysteries are the construction techniques used to build the Great Pyramid of Giza and other structures made of very heavy stones or very large numbers of stones or both. For example, estimates for the number stones used for Khufu's pyramid range from 590,712 to over 2 million, most weighing around 2.5 tons, and the Colossi of Memnon statues weigh over 700 tons each. There are several theories to explain how they were made, but there are problems with any one of them. Quarry locations are known and we can see where the stones came from, so we know they weren't cast like cement. Wooden rollers are unlikely due a combination of terrain and a lack of sufficiently strong wood, especially for large stones. The most likely methods for moving the stones probably involved a combination of ingenuity and brute force. For example, smaller stones weighing up to two tons could have been carried fairly easily by gangs of laborers. For a gang of 60 the load would be less than 70 pounds each. In essence they could have simply picked them up and walked off with them. For larger stones, the problem becomes much more difficult, but the task could still have been accomplished using a combination of levers, ropes, blocks, sleds, tracks, counterweights, and physical labor, including animals like oxen. So although flying saucers are not needed to explain how these feats were accomplished, we still don't know for sure how it all was done. The only connection these ancient structures may to have with aliens is by way of ancient symbols and myths. For example the Egyptian God Aten is usually interpreted to be a deification of the Sun itself. However proponents of the AAH point to further details that describe Aten as a disk or sphere that although like the Sun, was also separate from Sun and carried their God within it. They also point to The Story of Sinuhe, which describes a deceased King being lifted up into the disk to become one with it. Debate about the literal interpretations of these texts will no doubt continue to fuel the AAH for time to come.